*Click the title above f0r a complete Japanese version of this release (incl. DPJ press release). 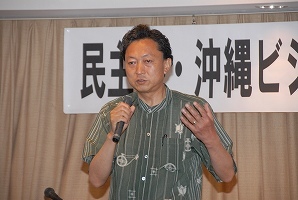 On August 11, the Democratic Party of Japan held a public symposium on its new Okinawa Vision 2008 which outlines the whole of its basic Okinawa (U.S. base) policy designed to take effect after taking power of the government, according a local news source and the official party press release. The "Vision" has been released since July 1997 on a tri-annual basis and it represents a most formalized statement of DPJ's policy which requires the approval by the Next Cabinet or the shadow cabinet. Considering Okinawa’s geographical and historical characteristic that played the unique role of “Island of Peace” in various international negotiations including the 2000 Kyushu-Okinawa G8 Summit, attracting international organizations and UN offices to Okinawa (for example as a UN Pacific Rim Headquarters) is both meaningful and desirable for stability and development of East Asia as well as for sending the message of peace. In practice, the Shimojishima Airport of Miyakojima City could be utilized to create outposts for UNEPS (a UN Emergency Peace Service) or a UN Human Security Centre for human resource development, as well as for enhancing the coordination with the ASEAN Rescue Team and the Japan Disaster Relief Teams that were recently dispatched to various disasters including the cyclone disaster in Burma and the Schezuan earthquake disaster in China. For this purpose we believe an active deployment of Miyakojima’s “2007 Shimojishima Airport Utilization Plan” is pertinent. This was a first leap forward from theDPJ's initial policy on UNEPS that merely recommended the government to facilitate the establishment of UNEPS. Now the party is thinking about preparing to establish the UNEPS by itself once power transfer takes place. Since the Vision is to be reflected in the party's Manifesto which will be finalized before the next general election, it is likely that the establishment of UNEPS would become an official party policy for the years to come.